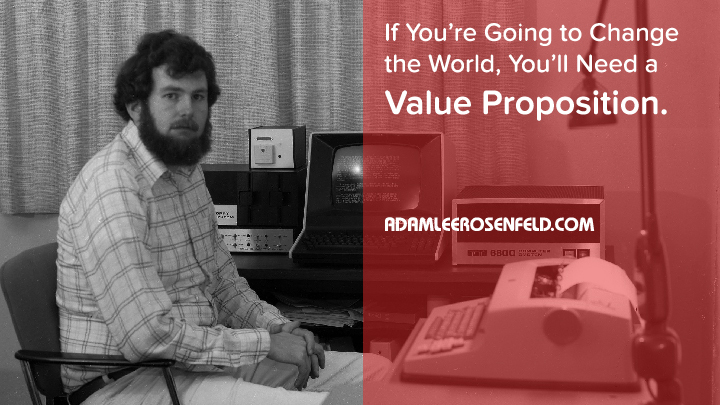 If You're Going to Change the World, You'll Need a Value Proposition. If I asked you for a business card right now, and you could give it to me, what would it say? I mean, who can fit who they are on to a business card? And for those who can, are you showing people who you truly are? How you can best serve them? Looking to get better at managing your life? It all starts with definition. Click here to get my free life-planning blueprint. Not too long ago, if you were to ask me to pick one thing to put on to a business card, it would be some obscure logo for a band, and a link to a Bandcamp page. Why? Because that’s what I love doing, playing loud rock music. A business card needs to communicate the greatest value that you can give people in the quickest and clearest way possible. This is called a value proposition. Everyone’s a king or a queen of their own personal kingdom, and you have about 14 seconds to hold court with them and show them who you are. In life, you have to be crystal clear not only about your own identity, but about how you can give to others. Hi, I’m Adam. I’m a life strategist. I help principled young adults and parents define their dreams and obligations, so they can change the world while paying the bills. You can see it in the wild right here. This may sound simple, but it wasn’t an easy journey getting here. I had to go around the mountain a lot of times to come up with my own value proposition. And what did I learn from this process? It all starts from the same place – with understanding the concept of value. I don’t believe that you can come up with a good value proposition without understanding what value is. And what is value? Well, let’s try to find out by asking a bit differently: what is the most valuable thing in the universe? Is it gold? Oxygen? Lithium deposits on Alpha Centauri? A mint-edition copy of Strange Tales #114? Folks, this is where faith comes in. Discovering what the most valuable thing is requires us to step outside of ourselves and embrace another perspective. It requires us to look objectively at ourselves. The perspective that I embrace tells us that the most valuable thing in the universe is – you. This most valuable thing is human beings. That’s a solid truth. And it’s a truth that’s trampled upon day in, day out, by our culture, our societies, and ourselves. That’s why the world needs you and your awesome value proposition. Once we understand this truth, our lives become less and less about ourselves. This is because we’re already taken care of by the Person who paid the highest price for us. Now our lives are about communicating that truth to others – that they’re the most valuable thing in the universe. We value them by spending time developing our own value proposition. Again, creating a value proposition is not an easy process. It takes time. But this is how we go from being drifters in life to leaders in life. Once we offer ourselves to others, we also offer to them the change that comes with accepting our help. And when people accept your help, they need you to take them to that place where the change happens. They need you to lead them. Going from being a drifter to a leader means identifying how you can best help others, and by leading them to the change that happens as a result. And you know what? It’s OK to change your value proposition every once in a while as well. It’s a journey of discovery, but it starts by giving. By giving what is most valuable. By giving yourself. So how can you offer help to others in a clear and effective way? What’s your value proposition? Let me know in the comments below! ← Plan Your Next Year by Following Your Heart. Carefully. Amazing truth ,it’s like a clear sky! I am not sure I know. Have different specks of ideas but I couldn’t say it. What should I do? * First I wrote in my journal [Evernote] all the possible value propositions that came to mind. * Then I picked the ones I thought were OK and shared them with my wife, for her helpful (and sometimes brutal) criticism. * After that I was left with about 1-3 options. I shared those options with the forum at https://platformuniversity.com/ (I’m a member over there). From the feedback I got there, my options were a bit more refined. You may have some forum or team or group you can share with as well, you might want to think about that (I’m here for ya too). * Finally, I picked one and used it for a while. * Then I repeated the process months later.